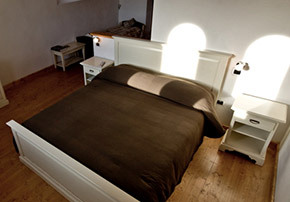 Locanda Incantata is a big and elegant family-run B&B, conceived for the lovers of art and nature and for those wishing to combine relax and fun. 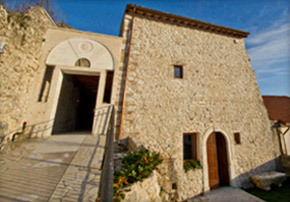 The property, known as the "Stables of Bontempi palace", is a rural building dating back to sixteenth century and it has recently been refurbished, preserving its original structure; the result of this, is a cosy dwelling where the charm and prestige of the ancient times coexist with the comforts of the modern ones. Locanda Incantata allows you to relax indoors and outdoors: inside, the rooms are wide and comfortable, with a breath-taking view over the marsicano landscape. On the outside the building is surrounded by a wide garden where Guests can enjoy the panoramic viewpoint and take advantage of the free time equipment (tables, chairs, beach chairs, games and toys for adults and children). In order to ensure the privacy and safety of each family, each housing unit has been provided with an independent access and a stand-alone plant design. For a greater easiness of payment, we accept the cash payment as well as Credit Cards, ATM cards and checks. 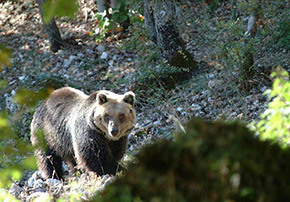 guided visits to parks, museums, sites and historical ruins. 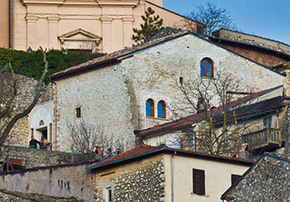 The excellent location of the B&B is an ideal starting point for the purchase of food and wine products, as well as handicraft products in the farms or in the little shops of the village and perfect to plunge in the local folklore during the events and the festivals in Scurcola and in the whole Marsica. Locanda Incantata is an extraordinary location to organize private parties. 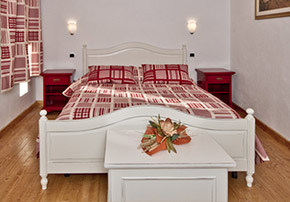 Locanda Incantata offers its Guests four rooms, ten beds in all. 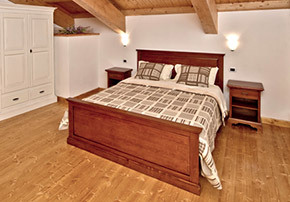 Nebbiolo and Sagrantino rooms are equipped with comfortable double beds; in Montepulciano and Negroamaro rooms there is a third bed. All rooms have a private entrance, a private bathroom (shower or whirlpool bath), mini-bar, digital TV, Wi-Fi Internet connection. The rooms are characterized by a refined simplicity of the furniture and by the choice of first-rate materials, such as the solid wood used for flooring, the oak-beamed ceilings, the fixtures, the doors and the furniture. The two-colour of the rooms, dominated by the natural white walls and by the country-style furnitures, as well as the warm hazel wood, gives the ambiance a sober and a classy atmosphere but, at the same time, a climate of great intimacy. Equipped with wide windows with striking view on the surrounding landscape and dominated by an absolute silence during the night, the rooms of Locanda Incantata allow our customers to indulge in a singular and reinvigorating experience, perfect for those who want to leave behind the stress of everyday life and enter in an"other" dimension of peace and intimacy with nature. The attention to detail that is given to the rooms is also given to toilets, paved in porcelain tiles and equipped with the most modern and exclusive comforts. Children under 3 years: Free. Children up to 6 years receive a discount of 30%. 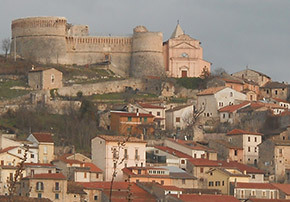 Locanda Incantata is in the highest area of Scurcola Marsicana’s old town centre, a typical Medieval hamlet protected on the back by the San Nicola mount and dominated by the Rocca Orsini (dating back to the Renaissance time), icon of the village architecture. The village, located at 750 metres above sea level, is an authentic panoramic viewpoint on the Piani Palentini and on the entire, Marsica striking panorama. Moreover, Locanda Incantata is only 100 kilometres far from Rome, and you can easily reach it from the motorway Rome - L’Aquila - Pescara and from the highway Sora - Avezzano - Cassino. If you come by car, we suggest to reach Via degli Orti Incantati passing through Via della Vittoria, and not through Via del Castello (which we recommend to those who reach us on foot). 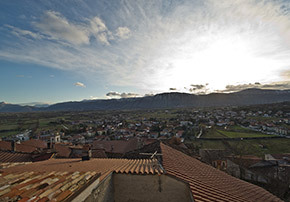 Given the excellent location of Locanda Incantata, important games reserves are at your fingertips (Abruzzo National Park, Velino Sirente National Park…), as well as old towns centres, archaeological areas and places where you can practice sports and excursions.